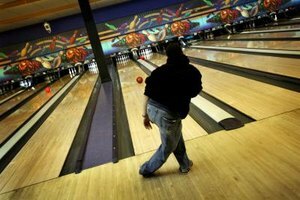 Bowl a few frames with your date at the Plano Super Bowl. Plano doesn’t have its own professional team, but you can attend professional football, basketball, hockey and baseball games within a 30-mile radius of Plano in the cities of Dallas, Irving and Arlington. In addition, the RoughRiders baseball team plays at Dr. Pepper Ballpark about five miles away in Frisco and keeps local fans talking. If you prefer to catch your sports in a bar, enjoy the food and camaraderie at The End Zone with televised games and occasional celebrity visitors. The Franchise Grill has a screen to cover almost every professional, football, baseball and hockey game broadcast, in a classy, clean environment, with enthusiastic fans. Plano has many good restaurants, including the usual chain offerings, but if you want something truly enjoyable to palate and ears, stop by Steve Fields' Steak and Lobster Lounge. The lobster lounge features a piano bar with both local and visiting pianists, providing a wonderful accompaniment to the tasty menu items. For a more lively atmosphere, take in the Sambuca 360 with its live music from various dance bands and groups and scrumptious menu items; check their music calendar for your favorite type of music. If your date is into museums and history, Plano and nearby communities provide many options. Train enthusiasts will enjoy the Museum of the American Railroad in Frisco, where you can see and experience how trains and rails shaped this country. Plano’s Heritage Farmstead Museum gives you a glimpse of life on the prairies of Texas and is suitable for dates with your entire family. If you have family members who are or were Masons, take your date to the North Texas Masonic Historical Museum and Library to see how the Masons helped shape Plano and other North Texas communities. If music, dancing and theater arts appeal to your date, Plano has some fancy dress and casual options. The ArtCentre of Plano displays local artist work with talks from the artist. The Chamberlain Performing Arts includes ballet, musical and theater productions with reasonably priced tickets and outstanding performers. For orchestra lovers, check out the Plano Symphony Orchestra, performing in various locations and events around Plano, especially during the holiday season. If you are looking for something seasonal, fun and family-oriented, travel 10 miles to McKinney for the Killis Melton Ice Cream Crank-Off in June -- you can enjoy the best homemade ice cream in Texas while listening to local musicians. Enjoy carnival rides, magic shows and vote for the best ice cream flavor while you are there. For winter holiday dates, visit the Plano subdivision of Deerfield holiday lights tour. The displays are a favorite local attraction and some light displays are synchronized to music.